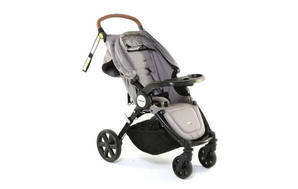 Snapshot: The Steelcraft Agile Elite is a single stroller with 4 wheels. But how safe and easy to use is it? Drink holder on front tray. Compatible with Steelcraft and Safe N Sound Unity baby capsules.